This problem is inspired by an example in Cameron Davidson-Pilon’s book, Bayesian Methods for Hackers. The code I wrote for this chapter is available from http://thinkbayes.com/price.py; it reads data files you can download from http://thinkbayes.com/showcases.2011.csv and http://thinkbayes.com/showcases.2012.csv. For more information see Section 0.3. To choose a prior distribution of prices, we can take advantage of data from previous episodes. Fortunately, fans of the show keep detailed records. When I corresponded with Mr. Davidson-Pilon about his book, he sent me data collected by Steve Gee at http://tpirsummaries.8m.com. It includes the price of each showcase from the 2011 and 2012 seasons and the bids offered by the contestants. These distributions are based on actual data, but they have been smoothed by Gaussian kernel density estimation (KDE). Before we go on, I want to take a detour to talk about probability density functions and KDE. So far we have been working with probability mass functions, or PMFs. A PMF is a map from each possible value to its probability. In my implementation, a Pmf object provides a method named Prob that takes a value and returns a probability, also known as a probability mass. For a given value of x, this function computes a probability density. A density is similar to a probability mass in the sense that a higher density indicates that a value is more likely. But a density is not a probability. A density can be 0 or any positive value; it is not bounded, like a probability, between 0 and 1. If you integrate a density over a continuous range, the result is a probability. But for the applications in this book we seldom have to do that. Instead we primarily use probability densities as part of a likelihood function. We will see an example soon. Density takes a value, x, and returns the corresponding density. MakePmf makes a discrete approximation to the PDF. Pdf provides an implementation of MakePmf, but not Density, which has to be provided by a child class. __init__ takes mu and sigma, which are the mean and standard deviation of the distribution, and stores them as attributes. Density uses a function from scipy.stats to evaluate the Gaussian PDF. The function is called norm.pdf because the Gaussian distribution is also called the “normal” distribution. But with real data, there is no guarantee that the distribution is Gaussian or any other simple mathematical function. In that case we can use a sample to estimate the PDF of the whole population. In the sample, no values appear between 28801 and 28867, but there is no reason to think that these values are impossible. Based on our background information, we expect all values in this range to be equally likely. In other words, we expect the PDF to be fairly smooth. pdf is a Pdf object, estimated by KDE. pmf is a Pmf object that approximates the Pdf by evaluating the density at a sequence of equally spaced values. linspace stands for “linear space.” It takes a range, low and high, and the number of points, n, and returns a new numpy array with n elements equally spaced between low and high, including both. The PDFs in Figure 6.1 estimate the distribution of possible prices. 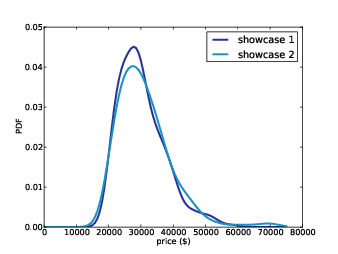 If you were a contestant on the show, you could use this distribution to quantify your prior belief about the price of each showcase (before you see the prizes). When diff is negative, the bid is too high. As an aside, we can use this distribution to compute the probability that the contestants overbid: the first contestant overbids 25% of the time; the second contestant overbids 29% of the time. We can also see that the bids are biased; that is, they are more likely to be too low than too high. And that makes sense, given the rules of the game. Finally, we can use this distribution to estimate the reliability of the contestants’ guesses. This step is a little tricky because we don’t actually know the contestant’s guesses; we only know what they bid. prices is a sequence of showcase prices, bids is a sequence of bids, and diffs is a sequence of diffs, where again diff = price - bid. Again, we use the variance of diff to estimate the variance of error. 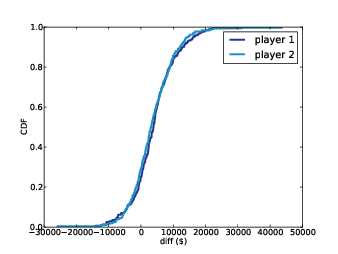 This estimate is not perfect because contestants’ bids are sometimes strategic; for example, if Player 2 thinks that Player 1 has overbid, Player 2 might make a very low bid. In that case diff does not reflect error. If this happens a lot, the observed variance in diff might overestimate the variance in error. Nevertheless, I think it is a reasonable modeling decision. ErrorDensity works by evaluating pdf_error at the given value of error. The result is a probability density, so it is not really a probability. But remember that Likelihood doesn’t need to compute a probability; it only has to compute something proportional to a probability. As long as the constant of proportionality is the same for all likelihoods, it gets canceled out when we normalize the posterior distribution. PmfPrice generates a discrete approximation to the PDF of price, which we use to construct the prior. To construct the posterior, we make a copy of the prior and then invoke Update, which invokes Likelihood for each hypothesis, multiplies the priors by the likelihoods, and renormalizes. Figure 6.3 shows prior and posterior beliefs about the actual price. The posterior is shifted to the left because your guess is on the low end of the prior range. On one level, this result makes sense. The most likely value in the prior is $27,750, your best guess is $20,000, and the mean of the posterior is somewhere in between: $25,096. 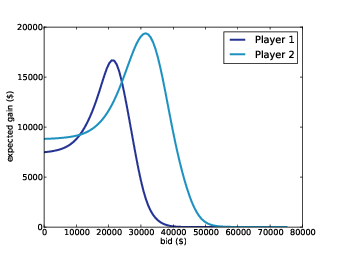 Figure 6.4: Expected gain versus bid in a scenario where Player 1’s best guess is $20,000 and Player 2’s best guess is $40,000. Both answers are based on the CDF of diff. If the opponent’s diff is less than or equal to -1, you win. If the opponent’s diff is worse than yours, you win. Otherwise you lose. One of the features of Bayesian estimation is that the result comes in the form of a posterior distribution. Classical estimation usually generates a single point estimate or a confidence interval, which is sufficient if estimation is the last step in the process, but if you want to use an estimate as an input to a subsequent analysis, point estimates and intervals are often not much help. 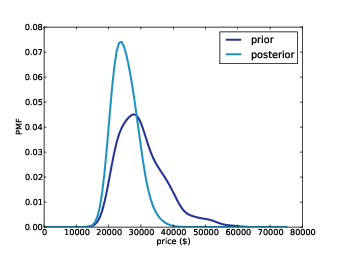 In this example, we use the posterior distribution to compute an optimal bid. The return on a given bid is asymmetric and discontinuous (if you overbid, you lose), so it would be hard to solve this problem analytically. But it is relatively simple to do computationally. Bayesian methods are most useful when you can carry the posterior distribution into the next step of the analysis to perform some kind of decision analysis, as we did in this chapter, or some kind of prediction, as we see in the next chapter.